THIS is why I grow food. 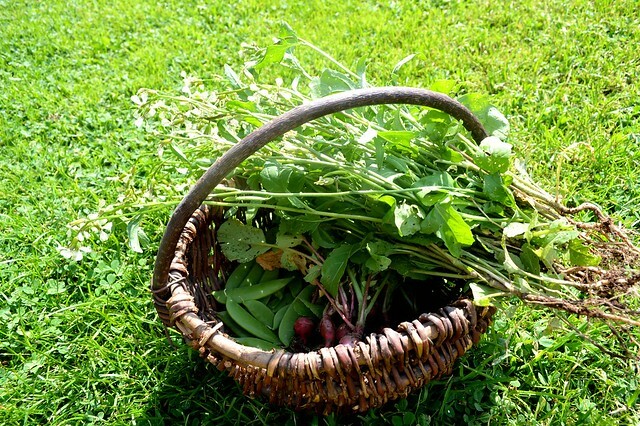 This evening, I spent nearly 45 minutes just harvesting and shuttling produce into my kitchen: arugula for pesto, radishes, peas to blanch, broccoli to blanch, lettuce for dinner, herbs to freeze or dry. 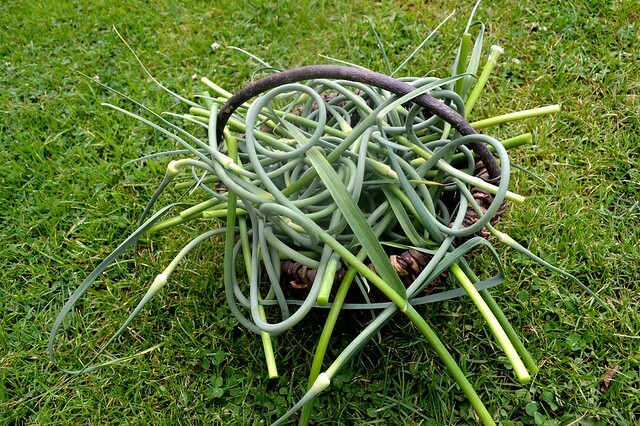 Scapes for... tbd. Kale to blanch. Then I loaded up Terry Gross interviewing Amy Schumer (brilliant!) and set my knife in motion. This summer I have made it a mission to start filling my freezer early. I usually have no problem in the peas and beans department-- they're so numerous, in their season, that there's nothing to do with them but freeze 'em. But kale? Kale we always run out of mid-Feb, just when I need that green lift the most. 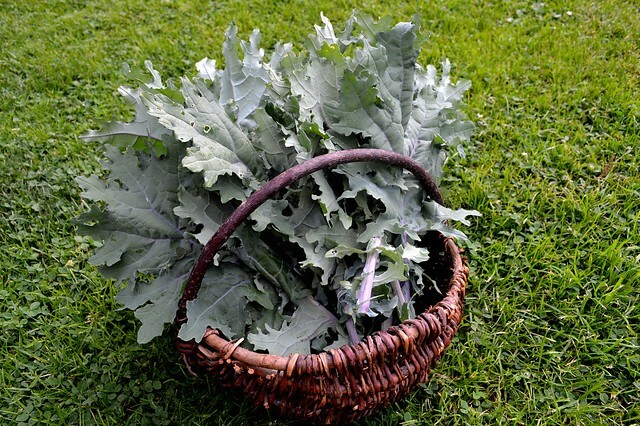 So, I took pruners to my garden kale-- which I've begun lovingly calling Kale Henge, it is so architectural-- and gave it a trim. I've tried many varieties of kale in my years as a grower of the stuff, and I have to say, for vigor you cannot beat Red Russian. It grows like a weed, and tastes terrific. 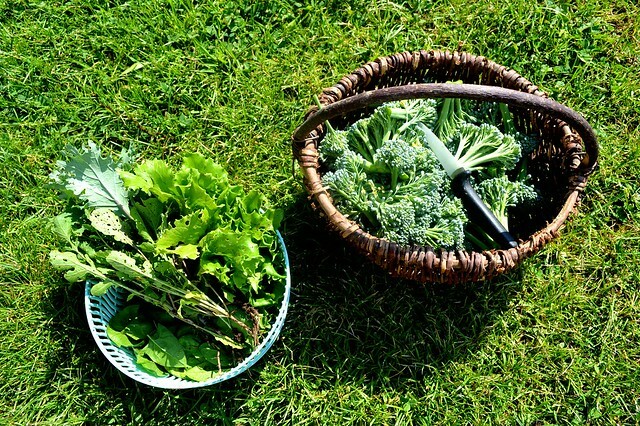 As summer moves forward, I'm going to try to commit myself to one big prepping and freezing session per week-- time to put away more than what needs to be put away, this minute, time for things like freezing fresh herbs and oh, that kale. So far in the freezer I have a gallon and a half of peas, and 3/4s of a gallon of broccoli, plus the herbs. And a big bag 'o kale. The garden is looking terrific. The potatoes and tomatoes are flowering, the zucchini have buds, the peppers have buds, the peas are getting ever-higher. The garlic is about ready to be pulled, and replaced with carrots. The beets are about ready, too, and I'm looking forward to another installment of this stuff. Life is, generally, a swell thing. Dinner was veggie tart with arugula pesto, scapes and broccoli, plus a giant salad. It was awesome. Hey there! I wrote about freezing herbs here: http://sweetfernhandmade.blogspot.com/2009/04/thrifty-kitchen-fresh-herbs.html a few years ago-- works great for anything soft and easily bruised, like basil, dill, cilantro, or parsley. 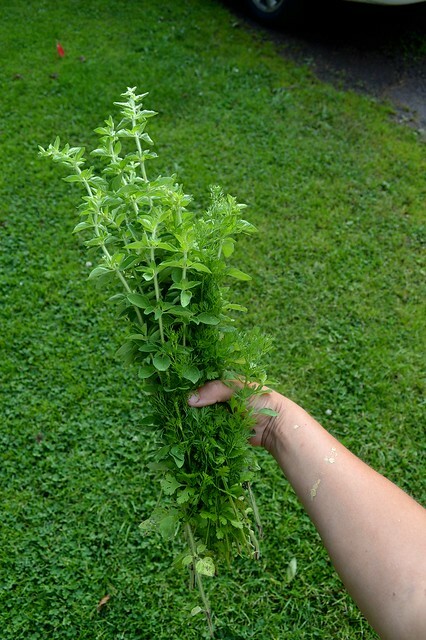 Woody or more sturdy herbs like oregano I dry by hanging from the rafters in my shed (it gets pretty hot in there...) but spread on a cookie sheet in a really low oven will also work. Then just crumble and fill your jars. Enjoy! Jealous am I! Looks fantastic. Hello - visiting from Soulemama - my your produce is impressive! We have such a short season here and most stuff isn't ready till August - then it is a mad dash to preserve it. We don't get very sever frosts though, so the Kale can stand all winter, then we can akso harvest the wee flower shoots in early spring. I am growing red Russian too this year. Nice to see your garden - I haven't posted my photos yet.